Finally 2017 is over. Good riddance! It was a crappy year in so many ways. Feels great to get a new year, a clean slate. Phew! Of course not much has changed, but there is a sense of freedom, peace and possible new beginnings. A second chance to get things right, or at least better. “Oh my, what happened to her?” you might think. Nothing really. I’m safe, I’m healthy, but last year was a struggle. It was dark, scary, difficult, lonely and basically quite depressing. I had lost my way and was stuck in fear, guilt and indecisiveness. 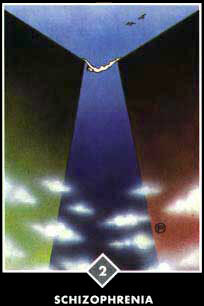 In Osho Zen Tarot there is a card showing a person lying like a bridge between to rocks. He/she is trying to hold on to one side with the fingers and the other with the toes. The fall is inevitable, but should you let go of the hands first, or the feet? That’s where I’ve been, and actually still am. As an expat you are stuck between the homeland and the new country. You belong to both, and – once you’ve left home – you always will. I’m not a refugee, I left of my own free will, but it can be hard anyway. Where do I belong? What is my true identity? I miss my family, what shall I do? In 2017 I tried to make a decision. I do live in Berlin, but I have most of my belongings in storage in Sweden. They are just things, but I miss my books, my CDs, my coffee cups and other “stuff”. They are a part of me and my past. Without them (and my family) I feel divided, even broken. I didn’t manage to solve the puzzle last year, and therefore I stay divided. Over the course of a lifetime we meet and say goodbye to a lot of people. Death is one big dramatic reason of course, but also change in general. We may need different people in different life periods. Best friends may always stay together, or they might drift apart for whatever reason. In 2017 I made the decision to end a friendship. Not because I didn’t care, but because I felt we had gone in different directions and the connection was lost. In another relationship a door closed, but a new one opened. I’m not sure what I’ll find if I choose to walk through it. Then a longtime friendship suffered the blow of illness. I got to see my life without this person, and how many memories and experiences connect us. Without my friend I would lose a big part of myself. Luckily it didn’t happen. Not quite. I’m tired of not feeling good enough. I’m tired of being torn between my heart and my mind. May this new year bring me enlightenment and peace. May this year show me a new way. May this new year send me joy and abundance. May this year see my story come to an end. I’ve been writing and thinking about it for so many years. It’s time. Let it come. I’m waiting. Previous Post How Do We Grow Spiritually? Next Post Do You Listen?